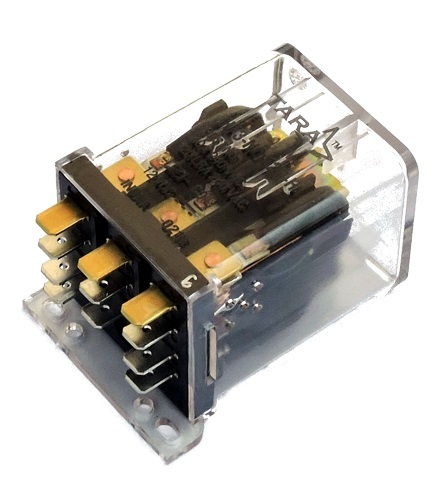 HF3 is a heavy-duty chassismounting relay available in a strong transparent enclosure. It is a 40A relay with a 3CO, 3NO or 3NC configuration. These configurations further reduce useless expenditure. Relay mounting is insulated. Various DC and AC coil voltages are available. One of the unique features of this product is its contactor style barrier insulation between different pole contacts thus ensuring protection from arc jumps between phases while switching. Insulation in this relay is class F. It has a high Inrush Current handling capacity, and a non-plastic high temperature-withstanding base. This relay has an international standard base pitch and can be used with market standard relay sockets. Terminal options of solderable and Q.C are available for the connectors. The high performance and cost effectiveness of this relay makes it suitable for all type of industrial and commercial applications. e.g. HVAC, motor and pump protection and control, stabilisers, control panels, inverters, temperature controllers, industrial and power electronics etc. HF3 is a perfect low-cost alternative for all small contactors. The range of TARA also includes AC and DC coil relays in both PCB and panel mounting, from 5A to 40A and in 1, 2 and 3 pole power relays.